Annie's Texas Musings - Don't Be Sorry! I found the above quote one day this week and it just kept running through my mind. It so reminded me of the Free Write Friday prompt we had a few weeks ago -- Serendipity! We all need to take more time and follow the words of this quote and I know there will be much more serendipity and our lives will be richer for doing so. 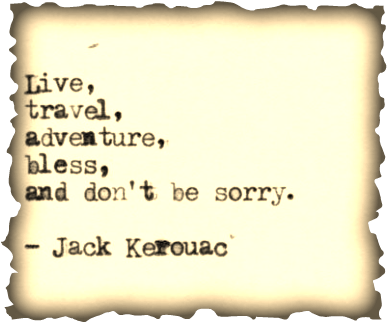 Jack Kerouac is an author that I vow to read more about, more of his works, more of his life. Just one more on a list of many that I need to attend to ... my reading bucket list! Below you will find several of his Haiku and one longer poem. Being a micropoet who also writes longer free verse, these speak to me in volumns. Now to decide where to start reading Jack...my usual is to start at the beginning. In other words, read the first work to the last chronologically. That is a bit obsessive and for Jack, I think I need to read him with Serendipity...read Jack as I find Jack...not necessarily as Jack wrote in time. Click the picture above to follow the link where it was found.